Want to Link to Us? ~ Choose a Banner! If you'd like to Link to Us, you can. Just pick a banner, copy and paste the code in the text box. Add it to your website or blog. Your visitors will be able to find us, easily and quickly. No need to bother with downloading pictures to your hard drive. Only to upload them again, save them, host them.... Well, I'm sure you get the idea. 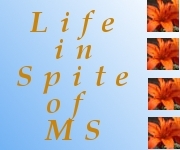 Now's the chance to quickly and easily add a link to your blog or site, of Life in Spite of MS, quickly and easily. And if you run into trouble, just contact us here. We'll see what we can do to fix the problem. Need another size banner you don't see here? Or want the banner to link to another page? Just contact us! 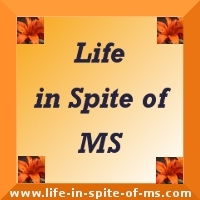 We'll make a banner that links to a specific page on our site. Or we'll make a different sized banner just for you. Go back to the Home page from Link to Us.